The term “monad” denotes the basic indivisible and indestructible building-block of the universe, according to the metaphysical doctrine of German mathematician and philosopher Gottfried Wilhelm von Leibniz. Architect Oliver Lang of Lang Wilson Practice in Architecture Culture (LWPAC) borrowed the term because of the efficiencies gained from modular design and construction. MONAD, located in the far west of Vancouver’s Kitsilano neighbourhood on West 4th Avenue, is a 12,600 square foot condo built on a standard 33-foot lot. Its designed to take all of the positive aspects of life in a single-family home (backyard, dedicated entranceway, a basement for storage) and converts it to work vertically. It includes three floors of residential (four units) over one floor of retail. The units in MONAD have several interior courtyards and light wells that punctuate the structure. By opening up the building with a central courtyard, bedrooms look out onto a landscaped inner courtyard and living space opens up to a view of mountains and water to the north and the street and park view to the south. To maximize light and cross ventilation, units also look onto light wells. The elevator runs up through the central courtyard, and each resident has a separate entranceway, outside, surrounded by gardens. Terraced outdoor living is very much a part of the structure. All have generous storage rooms in the basement, because LWPAC didn’t have to dedicate the entire lower level to parking—they used a car elevator instead, requiring only a few square feet for the vehicles. Prefabricated off-site allowed for speedy construction, where the pre-assembled modules – complete with drywall, wiring and plumbing – were lifted onto the site in mid January and complete by April. The building’s foundations, basement, retail level, parking and elevator structure were constructed on site. A sustainable advantage of prefab is the ability to tightly control the materials selection and waste generation. 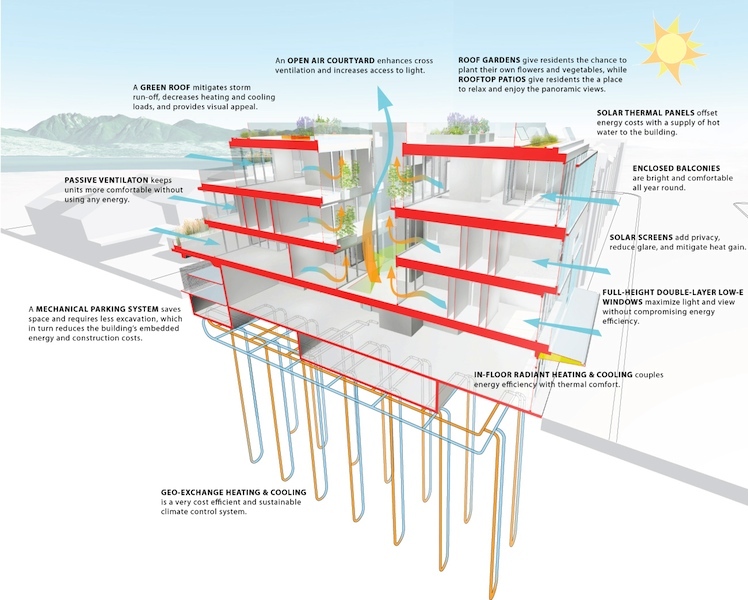 MONAD features an integrated vertical loop geo-exchange and solar thermal system with in-floor radiant heating and cooling. Recollective was the Sustainability Consultant on the project, advising on green building strategies, products and technologies. We also led the energy modelling and daylighting analysis process that received a research grant from BC Hydro’s Power Smart innovation program. This research study facilitated passive design with sliding solar screens and triple glazing that maximizes light and heat in winter and deflects it in the summer.